Blogging: What is it, and how has it affected the media is a broad scope article on blogging, and introduction with examples, counterexamples, and some effects of blogging on extant industries like the paper press. For someone who is wholly uninitiated to blogging, it gives a nice concise history, touches on some of the conventions and important notes (ease of use, early users, creators) and discusses some statistics and trends about the phenomenon. A funny thing happened on the way to the blog is about the history and effects of a civic blogger on the Rockville Central blog. It talks about lessons learned, issues regarding censorship, impacts vs. scale, and lots of other issues regarding a small scale, wholly volunteer endeavor in order to support civic interaction using a forcefully unbiased blog. One key idea is that a blog is simply a vehicle for content. The idea that the content is released chronologically is one special thing about blogging, but for the most part blogging is simply an easy, free interface for publishing any content to the web. One key idea is that blogging can come with great responsibility, especially if an audience is involved. One key idea is that blogging has very little in the way of thresholds. As each of us in this class has discovered, and as the Funny thing and What is it articles reiterate, there is no cost, very little learning curve, and wild potential for returns on investment while blogging, and it can be developed into a highly powerful platform for content. “(Blogs are) so very malleable that people are doing with it what they want to do,” Blood said. Her blag, “Rebecca’s Pocket,” is devoted to highlighting whatever catches her attentian, including the themes of media literacy, sustainability. Web culture and domestic life. She also pasts the occasional recipe. You don’t need an organization to have an institution. Rockville Central is literally two people who just spend time volunteering. There is nothing official about it, no phone number to call, no office to visit. Its only real expense is its domain name—about $6 per year. Yet it is enough of an institution that the mayor and some members of the city council have chosen to release statements through it. In city council meetings, office holders as well as citizens have spoken about something they have read in Rockville Central. It is unorganized, but it is still a community institution.to stay aloof from such things while still being relevant. It is a fine line to walk, and it takes willingness to resist flattery, threat, and cajoling. One of the most difficult and challenging concepts for me is why blogging isn’t far more popular than it is. For me the allure is in the free soapbox. For me, it’s a powerful way to connect with the world, start conversations, and participate, collaborate, and pontificate. I have heard many of my classmates bemoaning the required posting in their blogs, and I’m not sure why. I can’t stop myself from posting something here, and love the opportunity to get to do something I was doing anyway as part of a grading structure. What is the resistance about? 1. What will the next evolution of blogging look like? 2. What is microblogging and how is it different that blogging? 3. What other major popular social networking system is Evan Williams partially responsible for, and how does it relate to blogging? I’m doing a paper on Twitter, which is a form of microblogging. I see the posts that we are currently doing in blogs (such as civic blogging) as increasing in frequency, decreasing in size, maintaining attention, being sized for mobility, and developing a surge in interconnectivity. I feel like blogging is becoming more secondary to some of these kinds of primary interconnectivity networks, where we find out about the blog entries through our status updates, tinyurl links, and tweets. I’m always interested in the stats of various social networks and services because their popularity says something about their success by default. Here’s a recent post with a ranked site listing that has some enlightening details. But the blogosphere is not self-contained. What about bloggers’ other sources? This is something we’re asked pretty frequently. We know the independence and immediacy of the blogosphere has had a huge impact on mainstream online media. Much is made of the tension between the two – but what we’re seeing is convergence, and a symbiotic relationship. In the most recent State of the Blogosphere study, we asked bloggers about the other media that influence them. Not surprisingly blogs are in the lead at 61%, but this is followed by non-blog web content at 46%. So what is the influence of mainstream media sites in the blogosphere? 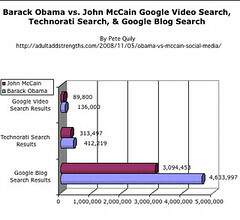 via Technorati Weblog: Since You Asked: The Technorati Attention Index. This is an interesting testimonial on the ways in which Twitter can enhance the classroom experience. In this case, this instructor is talking about technology-replacement, which is a form of digital media convergence, but, more often than not, I think technology-merging or even -cooperation is far more prevalent. At any rate, making a note of the post for my paper here. twitter has replaced email announcements. in the past, if something’s come up, or i want to add a reading, or we have a location change, i would send all the students in class an email. these days, when i have something to announce, or when my students have something to announce, we use twitter. twitter has replaced the cardboard box i used to bring to class on due dates. in the past, my students would print out their papers and bring them to class; i’d collect them in a box and take them back to the office to grade. these days, my students write blogs, design flickr sets, upload vidoe, and post works-in-progress. when finished, they tweet about it so that i – and, more importantly, their peers – can check it out. via Tame The Web » Blog Archive » Twitter in the Classroom.